JACKSONVILLE, Fla. (Sept. 28, 2017) – Dogs are well-known as “man’s best friend,” but for some of America’s service members, the bond goes much deeper. In celebration of National Dog Week, wounded veterans served by Wounded Warrior Project® (WWP) shared their stories about their service dogs, how the dogs have helped them cope with the visible and invisible wounds of war, and some tips for owning a service dog. How does your service dog assist you? 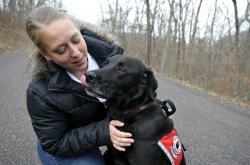 What do you wish everyone understood about service dogs? Are there any tricks to teaching a dog new commands? Are there any other guidelines you’d give to a new dog owner to help them create a loving, happy pup? What’s the best way to discipline a dog?